by Chris Woodford. Last updated: January 24, 2019. Everything you're about to read is a lie—and I promise that's the truth. Only joking! People tell lies for all kinds of reasons; with long jail terms (and sometimes even the death penalty) waiting for our worst convicted criminals, the temptation to lie can sometimes be enormous. Spotting lies and digging out the truth is vitally important to our system of justice, but how exactly can we do it? Trained law enforcement officers might have a hunch someone is lying, but without evidence or witnesses there's no way to be sure. Criminal scientists have long tried to find a foolproof method for detecting lies and the closest they've ever got is the polygraph. It's a chart-drawing machine that tries to detect when people are more nervous and agitated than normal (working on the assumption that this means they're lying). Polygraphs are highly controversial and in some countries their use is restricted or even banned altogether. Do they really spot lies? Are they any use at all in criminal investigations? Let's take a closer look! Photo: A traditional (analog) polygraph machine draws multiple graph lines on a moving paper chart. Simulated photo based on an original photo courtesy of US Geological Survey Photo Library. A polygraph is a machine that measures various different aspects of how a person's body is functioning and draws them as side-by-side lines on a moving paper chart or, more commonly now, as a chart on a computer screen. Each measurement is shown by a separate line (graph) and that's why the chart of multiple lines is called a polygraph: it's a many-lined graph. The measurements are of physiological (basic, body-related) things such as heartbeat, pulse, blood pressure, respiration rate, and perspiration. All these can be measured relatively easily; perspiration, for example, is found through what's called galvanic skin response (GSR), which is simply how much your fingertips allow small electric currents to pass over their surface (if they're moist with sweat, they conduct electricity better than normal). Why these particular measurements and not others? Because polygraph testers believe these things change quickly and detectably when a person starts lying and suddenly feels under great stress. Physiological things like this are difficult for most people to control quickly, consciously, and voluntarily (though that may be possible with practice). Photo: Looking at the results of a typical polygraph test. Modern tests are often done using sensors connected to laptops, so if you have a polygraph these days you're fairly unlikely to see the old-fashioned paper and trace. Photo by Valerie Smith courtesy of US Air Force. 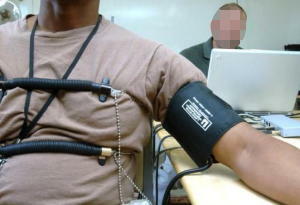 A person takes a polygraph test by sitting in a chair and being hooked up to the various body sensors. Usually there's a preliminary period of chat or discussion to help the subject (the person under test) to relax. During the examination itself, the tester asks the subject a variety of different questions; some ("What is your name?") will be answered truthfully and others ("Did you ever skip school? ", "Have you ever stolen money?" "Have you ever cheated on someone?") will force the subject to lie. For these questions, the tester knows whether the subject is telling the truth or lying so the responses are used as a baseline or point of comparison: they show how the subject normally reacts when they tell the truth or lie. In between these questions, the tester will ask a number of real questions about the particular crime or other situation that is being investigated. At the end of the examination, the tester compares the traces from each real question with those from the baseline questions. In theory, true responses and lies show up quite differently on the trace and are relatively easy to spot. People often refer to polygraphs as "lie detectors" but that's not quite correct. 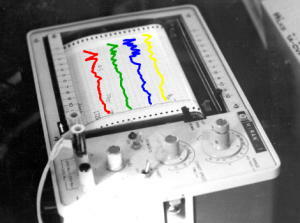 A polygraph is simply a graph of multiple physiological measurements shown side by side on paper. By itself, it reveals nothing about anything. Such a graph can be interpreted by a trained operator and he or she may believe that the traces reveal when a person is telling the truth or lying. But traditional polygraph machines don't detect lies and don't purport to. Modern polygraph machines are, arguably, a bit different in this respect. Now largely computerized, they show their traces on a computer screen instead of using wobbling pen marks on moving paper charts. 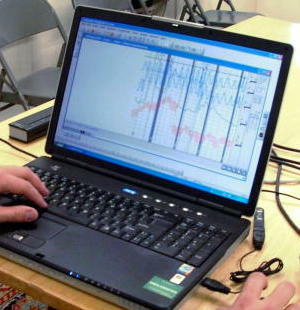 Sophisticated polygraph software running on these machines is sometimes capable of identifying irregularities in a person's responses and can suggest to the operator whether the person may be telling the truth or lying. In that respect, modern polygraphs are much more like lie detectors than traditional machines ever were. But detecting lies is still essentially a matter of interpretation. Can polygraphs help us detect lies? Polygraphs have been controversial pretty much since they were first developed in the 1920s. Trained operators believe they can genuinely spot when people are telling the truth or lying with a high degree of accuracy; others aren't so sure, arguing that the accuracy of polygraph tests isn't much better than tossing a coin. In 2003, a definitive review of polygraphs conducted by the National Academy of Sciences Board on Behavioral, Cognitive, and Sensory Sciences and Education concluded that "polygraph tests can discriminate lying from truth telling at rates well above chance, though well below perfection." The biggest criticism of polygraphs is that the changes they show up may not reliably indicate whether a person is lying or not: a polygraph test is inherently stressful, particularly if it's part of a criminal investigation, and that may bring out false positives (apparent lies that are really just responses to the stress of the situation). Countermeasures (deliberate tactics to mislead polygraph tests) are another problem. Some people claim they can train their bodies so they can lie brazenly without appearing to do so (in other words, producing false negatives) and there are plenty of websites that discuss how to cheat a polygraph test. The 2003 National Academy of Sciences report agreed that "Countermeasures pose a potentially serious threat to the performance of polygraph testing because all the physiological indicators measured by the polygraph can be altered by conscious efforts through cognitive or physical means." Photo: A polygraph test is inherently stressful—and that alone raises a questionmark over the validity of its results. Photo by Valerie Smith courtesy of US Air Force and Defense Imagery. But law enforcement officers take a much more pragmatic view and regard polygraph tests as another tool they can use to get to the truth. Simply suggesting that a suspect may have to take a polygraph test may be enough to make them confess to a crime. In other words, whether the test itself produces results is not always relevant: it may just be a helpful way of putting extra pressure on a guilty suspect. Useful or not, polygraphs remain as controversial as ever. In some countries, they are banned outright from use in criminal or other court cases. In the United States, though still sometimes admissable in court, they've been illegal for use in recruitment for jobs since the Employee Polygraph Protection Act (EPPA) of 1988. Artwork: A typical polygraph lie-detector from the mid-20th century. 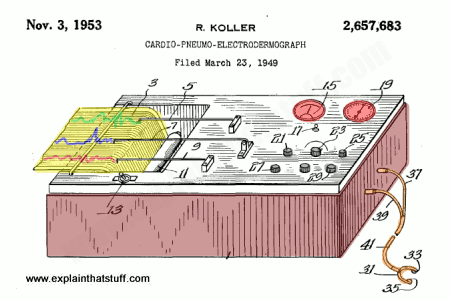 This one, invented by Robert Koller in 1949, is called a "cardio-pneumo electrodermograph," which is perhaps an unnecessarily complex way of describing a machine that draws traces (graphs) of heart-rate (cardio), breathing (pneumo), and skin perspiration (dermo). The drawing is taken from US Patent: 2,657,683: Cardio-pneumo electrodermograph, courtesy of US Patent and Trademark Office. Here's a brief summary of the history. 1730: English writer Daniel Defoe suggests taking a person's pulse may be a way to detect whether they're telling the truth during questioning. 1892: English physician Sir James Mackenzie develops a pen-trace polygraph for making medical measurements of a person's heart rate. 1895: Italian criminologist Cesare Lombroso uses a crude polygraph to measure a suspect's blood pressure and pulse during questioning. 1921: Canadian-born psychologist John Larson invents the original polygraph while working in Berkeley, California. 1971: Retired US Army officers Allan D. Bell, Wilson H. Ford, and Charles R. McQuiston develop a speech-sampling machine called a Psychological Stress Evaluator (PSE), which attempts to detect lies from the falterings, hesitations and other stresses in a person's voice. This technique is sometimes called voice stress analysis. 1988: Employee Polygraph Protection Act (EPPA) bans use of polygraphs for testing job applicants. 2003: A National Academy of Sciences (NAS) report suggests polygraph testing is "unreliable, unscientific, and biased," concluding that it works "above chance" but "well below perfection." Forensic science: Our simple introduction to the whole subject of criminal investigation, mainly aimed at younger readers. Want to know more? Read around the subject and make up your own mind! American Polygraph Institute: An organization of specialists supporting the use and validity of polygraphs. Anti Polygraph: Opponents of polygraph testing. The Polygraph Museum: Lots of information about the history and development of polygraph machines. The Complete Polygraph Handbook, by Stanley Abrams. Lexington Books, 1989. The Polygraph Test: Lies, Truth, and Science, by Anthony Gale. Sage Publications/British Psychological Society, 1988. Gatekeeper: Memoirs of a CIA Polygraph Examiner, by John F. Sullivan. Potomac Books, 2008. How to Beat a Polygraph Test by Malia Wollan. The New York Times, April 10, 2015. A former police detective points out the fallibility of polygraph tests. MRI Lie Detectors by Mark Harris. IEEE Spectrum, June 30, 2010. Could fMRI brain scans supersede polygraph tests as a more "scientific" evaluation of lying? Employer lie detector use 'grows': BBC News, 11 November 2009. Why companies are turning to lie detector tests to vet new employees. How do telephone lie detectors work? : BBC News, 7 September 2007. Considers the pros and cons of a controversial system called voice risk analysis (VRA). The future of lying by Chris Summers, BBC News, 14 January 2005. Could we develop more reliable lie detectors? What kind of technology would they use? The Truth About Polygraphs by David Burnham. The New York Times, January 4, 1986. This article from the Times archive tried to get truthful answers to a simple question: how does the government actually use polygraphs? The Polygraph and Lie Detection: Committee to Review the Scientific Evidence on the Polygraph, National Research Council, Division of Behavioral and Social Sciences and Education. Washington, DC: The National Academies Press, 2003.